The best things about traveling are meeting new people, learning new customs, hearing new languages, and trying new foods; especially desserts, and candies. 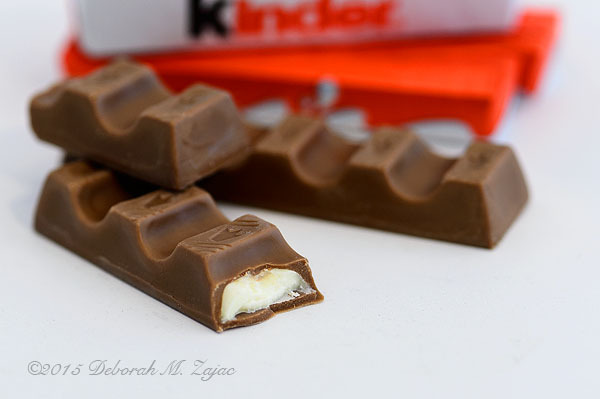 While wandering around the shops in Cozumel recently I found these little chocolate bars called Kinder. We don’t have them where I live so bought a box of 8 bars to bring home. They’re little pillows of milk chocolate with a soft milky filling. It’s tasty! I’m glad they’re small bars! Wow! Your photograph really, really, really makes me want to eat that chocolate! Have you had Kinder eggs? I always had fun putting the little toy inside together. Really? That’s wonderful! No. I’ve never had Kinder chocolate or eggs. Were the toys neat, and better than the Cracker Jack toys in my kids time? In my time they started going down hill, but early in my youth they were steel, or some kind of metal, and really neat to collect and play with. Today the toys are a joke and not really worth collecting en mon avis. You only buy Cracker Jacks if you really, really love the popcorn other wise make it yourself! I got Kinder eggs as an adult so I didn’t play with the little toys. But I did appreciate their cuteness for a few days. And they came in parts, with instructions to put them together. So there was the double delight of the surprise toy in the egg and the momentary thrill when it all came together. I once bought a McDonald’s Happy Meal in my mid-20s. It was fun to revisit that childhood anticipation and delight. We ate them all the time in Saudi! the kids love them yumm, thanks for bringing back memories!